...on this day that I took the first of a 3 session Intro to Sewing class at a local sewing machine shop. Can you believe it? May 1, 2012. Wow. 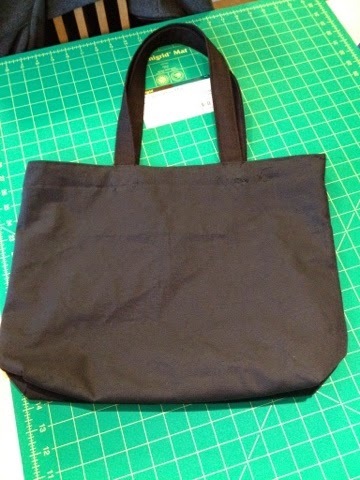 I made a simple lined tote bag in the first class. I even used rayon thread because nobody told me that I shouldn't! The first session of the class had actually taken place a few days earlier, but the manager of the shop wasn't terribly busy that week, so she worked me into the schedule on an individual basis so that I would be caught up with the other 3 students. 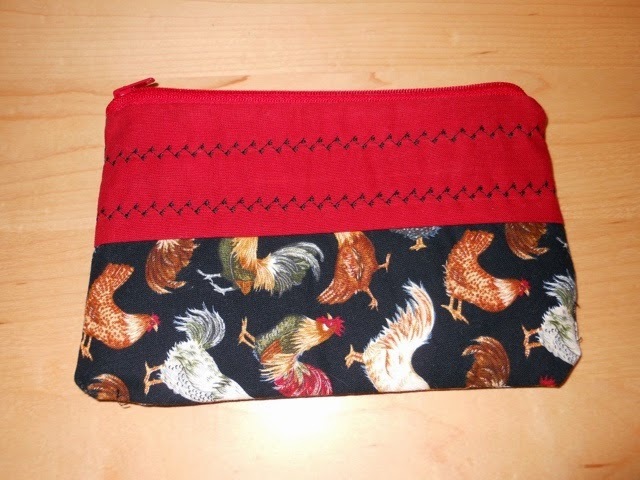 4 days after I did the catch up class for the tote bag, I made a lined zipped pouch. Hey, I even used decorative stitches (and more rayon thread)! It was during that class that I learned that you could actually change the blade on my rotary cutter to work for a left handed person. Yup, I cut my first 2 projects with a right handed rotary cutter. While this might not be an issue for lefties that are fairly ambidextrous, I am not one of those people. No, it isn't my terrible photo skills, both the top band and the decorative stitches are crooked. 2 weeks after the pouch, I made a quilted placemat in class with you guessed it, rayon thread. This one still annoys me because the sample used for the class had non-directional fabric, and nobody seemed to know which way the placemat was supposed to be oriented. 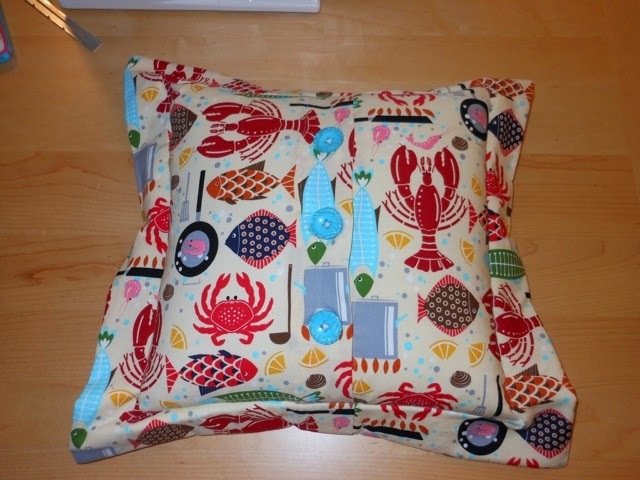 Three and a half weeks after session 1 of my class, I finished the Intro to Sewing series with a decorative pillow (complete with sewn on by machine buttons and buttonholes). I had done some research on my own at this point in time, and prior to this class, I had done some research online and found out that rayon thread wasn't my best option for construction. After learning that, I bought some Metrosene polyester thread and a Brother sewing machine. 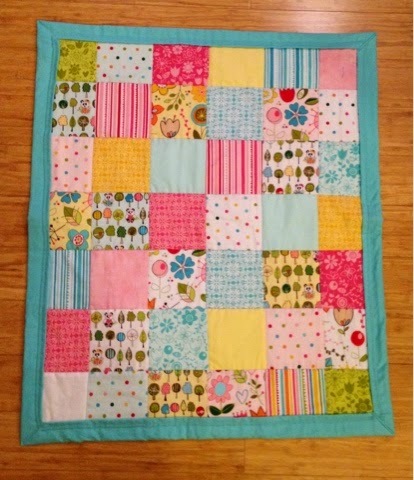 I started my first quilt 2 days before this class, but it wouldn't be finished until the day after the pillow. It was a project that I decided to do on my own. I bought a charm pack (which I actually washed), sorted them into rows, and sewed them together. I had quickly learned about stitching in the ditch during the placemat class, so I just did that for quilting. 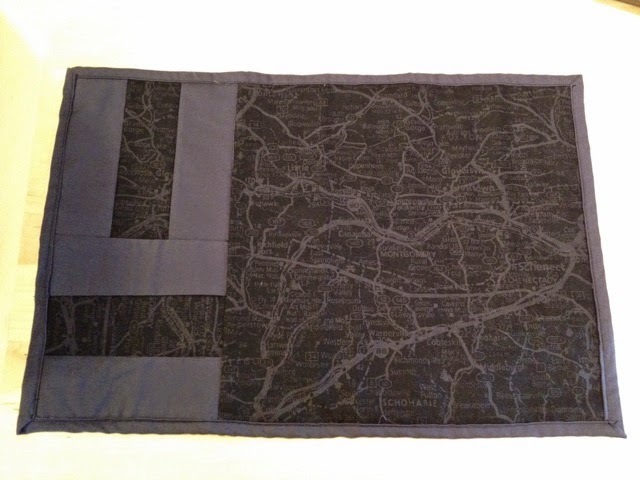 On the placemats, we did self binding by bringing the back to the front, so I did the same thing on the quilt. I always intended the recipient of the quilt to be my little calico cat, but my other cat seems to use it more (mostly because he's three times the size of the little cat). Looking back on the last few years, it seems more than a little surreal. My world had just been rocked a few days earlier when my grandfather passed away. I woke up one morning and decided that I wanted to learn how to sew. Yes, really, that's how it happened. Prior to signing up for the multi-session class, I had taken a Home Economics class in middle school. One of our units was on sewing. I don't know where or how it went so wrong, but our project, a simple pair of elastic waisted shorts, didn't fit. One leg hole was fine, and the other was too small. That experience was a little traumatic, and it would be 23 years before I would actually choose to sew something. If Mrs. Webster could see me now, I bet she would be shocked. She would be proud, I think, that I am spending today working on a project that will be headed off to spring Quilt Market (I can't show any pictures until the collection is announced), while wearing a shirt and pair of shorts that I made. If I leave the house for anything else today, I'll surely carry a bag that I've made too. Wow. To be honest, I didn't think that sewing would be much more than a casual hobby. With over 300 projects finished, a whole lot of new friends gained and way more money spent on all of the machines, notions, fabric than I want to try to add up, I am so thankful to have had the opportunity to be part of this wonderful, crazy, and inspiring world of sewing.